Carl Sagan once said that the average human could live a full, long life and never encounter any major disasters. 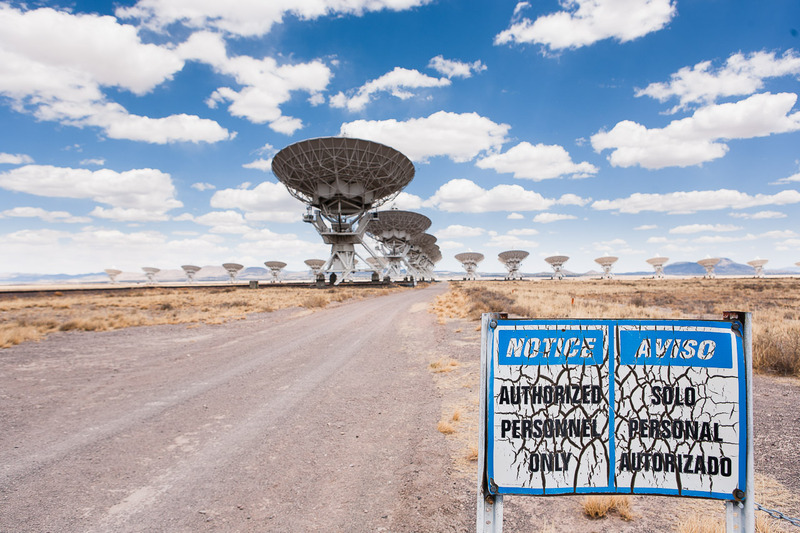 How fitting then that on our way to visit the array of radio astronomy telescopes known as the Very Large Array, we managed to experience another major disaster. Continuing our journey northward through New Mexico, we needed to stop for the night, and happened to be near the mountains. Laura heard about some free camping at a National Forest campground up in the foothills. The approach was incredible - late afternoon sunlight pouring over the plains and between the hills, backlighting the trees and the haze surrounding them. Then the pavement ended. A few dusty curves and cattleguards later, we found the sign that proved we had been heading in the right direction. We also found ourselves facing a rocky, dirty, tight switchback heading up the mountain in front of us. "Tight" is a relative term, of course. Just about any car would have no problem handling this particular curve, especially with four-wheel drive. When you've got 12 wheels, 55 feet and around 15,000 lbs. of vehicle, roads tend to look different. Five minutes later, we found ourselves sliding backwards despite driving forwards, with the trailer beginning to jacknife and the edge of the road (and the accompanying steep drop-off) getting closer and closer to my window. Two minutes after that, we were safely past the curves, hoping the parking brake would hold the rig in place while we walked back down the mountain to pick up the rear bumper of the Airstream, and all the contents of the storage compartment (sewer hoses, main power cable, tools, etc.) which said bumper had previously held together. We also found the plumbing fixture that allows us to connect to fresh water supply, and one of the rear stabilizing feet lying in the dirt. Shortly after that, we were parked in our "free" campsite with a wobbly trailer that had a shredded rear storage compartment and no way to connect to water. 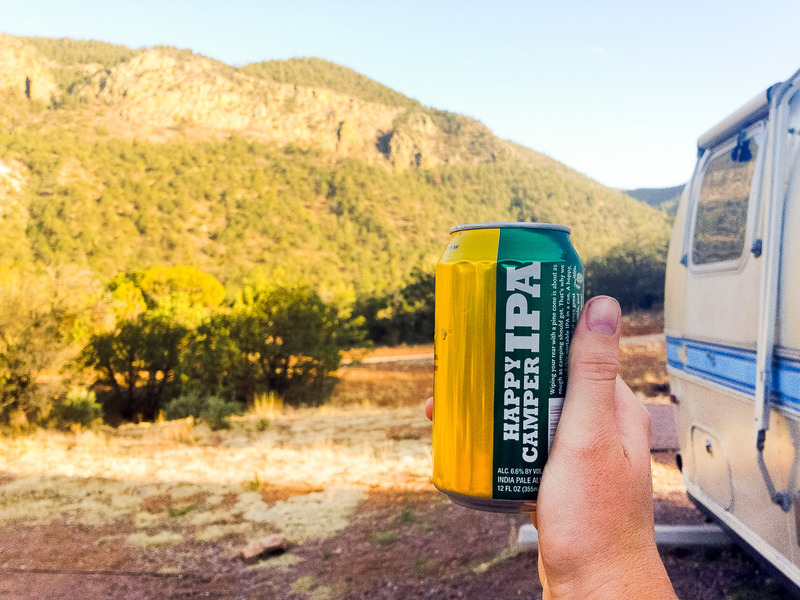 Well past beer o'clock, it was time to get into the six-pack we'd bought earlier: a beer mockingly called Happy Camper IPA. 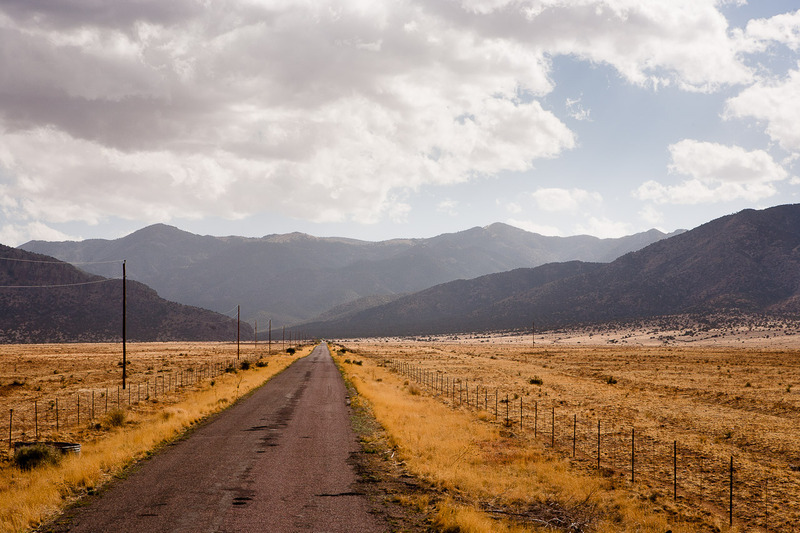 After Boondocking Disasters Part II: The Sequel, the next day we decided to head over to the main attraction, the National Radio Astronomy Observatory's Very Large Array. It's an array of 27 radio telescopes (which look less like telescopes and more like 82-foot satellite dishes) arranged in a Y-shaped configuration. Each telescope is aimed with incredible precision at the same, incredibly distant point in the universe, and collects incredibly minute radio signals emitted by stars and galaxies. The signals from each individual telescope are then combined into one larger signal, which effectively makes the entire array one large telescope. But because each branch of the Y-shape is made of railroad tracks, the individual telescopes (which you might guess, are on wheels) can be moved as needed to expand or contract the overall size of the array, reaching a maximum of 22 miles in diameter. The visitor's center is a quiet (especially at lunch time), modest mini-museum of the activity that goes on at the lab, and how it all works. 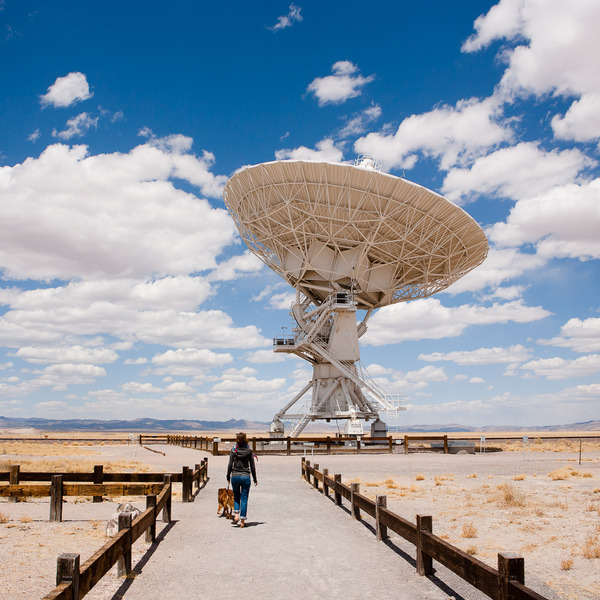 There are photos on the wall from the various film productions that have taken place at the VLA - the most notable of which is probably Contact, starring Jodie Foster and based on the book by Carl Sagan. There are large prints of some of the imagery produced by the telescopes, and a looping video presentation of an engineer touring the facility and explaining how the equipment works together. But you don't drive out to the middle of nowhere (an intentional choice of location by the scientists who founded the VLA) to be indoors looking at a stand-alone museum exhibit. The VLA has established a self-guided walking tour of the grounds, with sign posts explaining what you're looking at along the way. The path walks along some labs which are not open to the public, and out to the base of one of the telescopes, giving you an opportunity to see just how big each one really is. While Bulleit couldn't really comprehend what we were looking at, and made clear he was bored, the ameteur astronomer in me was delighted to see how everything worked, and hear the hum of science at work. For me and so many others, Carl Sagan's Cosmos has fostered an enthusiasm for astronomy and fueled the fire of those burning existential questions of who we are and and just what the hell we are doing here. The everyday life at the VLA is probably more mundane data processing than philosophical conjecturing, but the work they do makes visible the universe that is out there beyond the relatively few stars we can see on a clear night in our remote mountaintop campsite, reminding us that in the grand scheme of things, our rear bumper falling off isn't such a big deal. Special thanks to Stefan H. (who suggested Very Large Array (25miles west from Magdalena)) for making this blog post possible!